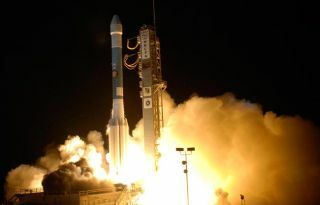 NASA's Phoenix Mars lander lifts off from Pad 17A aboard a Delta II 7925 rocket amid billows of smoke at Cape Canaveral Air Force Station at 5:26 a.m. EDT on Aug. 4, 2007. CAPE CANAVERAL, Fla. Carl Sagan, Arthur C. Clarke, H.G. Wells, Kim Stanley Robinson and other greats in science fiction hitched a ride to Mars today?in a digital form, at least. Planetary Society representative Amir Alexander hopes that future martian inhabitants will stumble across the little disk. "Imagine a person coming across this old relic of a spacecraft, which is what this beautiful spacecraft Phoenix will be in a few hundred years," Alexander said, adding that they should find the DVD attach with Velcro to Phoenix. "What he or she will hold in their hands is a message from our world to theirs." Phoenix launched at 5:26:34 a.m. EDT (0926:34 GMT) atop a Delta 2 rocket to begin a nearly 10-month spaceflight to the Arctic Circle of Mars near the planet?s north pole. The probe carries a trench-digging robotic arm and other instruments to sample martian soil and ice to study its chemical makeup, as well as help scientists determine whether the region once supported conditions in which life might exist. Although Alexander refused to divulge how much the disc cost to make, he said "it is in fact the most expensive DVD ever produced." The cost arises from is unique design and preparation. "This is a special DVD that's designed to last for at least 500 years," Alexander said, and is made of durable silicon glass. "It was Velcroed to the spacecraft, then baked" to remove explosive gas bubbles, sterilize it and ensure it sticks to Phoenix as it careens toward and lands on Mars, he added..
What's more, Alexander explained, is that the disk was designed to withstand the planet's bone-chilling environment. "It's designed to last several martian summers and winters," he said even Phoenix's eventual encasement in solid carbon dioxide ice at its northern landing site. The CD contains 161 novels and stories, 63 pieces of artwork and four radio broadcasts related to Mars, totaling 1.43 gigabytes of data. Inlcluded in the works are H.G. Wells' War of the Worlds, Ray Bradbury's The Martian Chronicles? and even Thomas Disch's The Brave Little Toaster Goes to Mars. Kim Stanley Robinson, a popular science fiction writer, said he is thrilled to have his short novella Green Mars included on the CD. "The idea that I'm part of the first library on Mars is really a fulfilling moment," Robinson said. Phoenix's launch wasn't the first attempt to send a digital library to Mars?the original was attached to Russia's Mars 96 lander. "Unfortunately, Mars 96 never made to Mars," Alexander said. "It made it to the bottom of the Pacific Ocean and that is where the original 'Visions of Mars' disc lies today." 'Visions of Mars' also wasn't the first record of humanity launched into space: Voyager 1 and 2 carried famous "golden records" beyond the reaches of the solar system. Scientific visionary Carl Sagan led the selection committee for the records' contents, and he also recorded an audio track for the Mars-bound tome in 1993 before he passed away. "For 99.9 percent of our tenure on Earth, we've been wanderers," Sagan proclaims on the disk. "Whatever the reason you're on Mars is, I'm glad you're there and I wish I was with you."